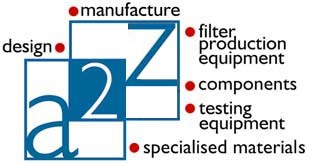 Air Filtration Equipment: A2Z offers a wide range of Air Filtration Production Equipment for HVAC, Mini pleat, HEPA, Cabin Air and Gas turbine Filtration. Cabin Filter Production Line: To address the needs and the rapid growth in Cabin Air Filtration, A2Z offers an automated line that is flexible, fit to purpose and cost effective for filter manufacturers. Engineering Services Design/Build:A2Z offers the services of its Design Team based at its Design Center to design and build, fit to purpose machines. A2Z also offer build to print options. The Team uses SOLID WORKS among other state of the art 3D design software to create and validate its designs. Expanded Metals: A2Z offers expanded metal material in Roll or cut to size to meet your expanded metal needs. Filter Caps & Components: A2Z offers over 4500 part numbers of filter components to meet customers specifications and drawings such as Filter End Caps, Filter Frames, Filter Housings, Bowls and Cover Assemblies, Cast and Machined Parts, Wire and Weld Mesh Cages, Perforated Support Tubes, Weld Mesh, Spinning items, Spiral Tubes, Rubber Components, Glass Filled Nylon 6 Moulded Caps, Expanded Metal Sheets in any size and pattern, Perforated metal Sheets, Perforated paper Sheets, Protective sleeves, Clamps, Plastic Components, variety of Sheet Metal Pressed Components, Fabricated parts, Aluminum Alloy Parts. Sheet Metal parts can be supplied in normal Mild Steel duly plated (White Zinc, Yellow Galvanized, Tin Plate coated etc) or in precoated Galvanized Steel G30/G60/G90. Panel Sets duly powder coated and in any thickness.Tooling for all pressed components are made In-House on HASS CNC machines. Metal Expander: A2Z Metal Expanders are capable of working on Aluminium, Brass and Steel. These machines convert metal sheets into metal screens. Equipped with automatic counting and shearing devices. This equipment can be preset to required mesh sizes with different die patterns. Mini Pleat: A2Z Mini Pleaters undertake Pleating of glass fibre & polyester filter media with Hotmelt bead spacing. Models: Ranges from working width of 200mm to 1500mm and Pleat Depth Ranges from 12mm to 300mm are available on both Blade/Rotary and a combination of blade and rotary pleating as per customers requirements. Pleating Machinery: A2Z Filtration manufactures a range of Blade Pleaters from the top of the line Intelligent Pleater to Cam driven Automatic and Economy model Pleaters. Each offers excellent value in various segments and for various applications in the Filter Industry. The intelligent Blade Pleater which is Servo driven allows a wide variety of pleating like the “W” Pleat, Step Pleat, Taper Pleat. Also available A2Z Servo Pusher bar pleaters. Pleaters | Rotary Type: A2Z Servo Intelligent Rotary Pleater are designed to produce a very wide variety of pleat depths without changing the indenting rollers. A2Z also has a range of PLC Controlled Rotary Pleaters that can produce Conventional, Pleat Lock, Dimple or Zig Zag type pleats.